Eau Claire, WI -- March 19, 2018 -- ARIES, a fast-paced innovator of truck, Jeep, SUV and CUV accessories, is pleased to announce that its patented new ActionTrac™ powered running boards are now available for the 2018 Jeep Wrangler JL (#3036571). The Jeep JL made its greatly anticipated debut late last year and has already generated excitement among Jeep enthusiasts and outsiders alike. With ARIES' own affinity for all things Jeep, developing an ActionTrac™ application that was simple-2-install™ for the Jeep JL was a top priority. ActionTrac™ boards are designed to be the next generation of power steps, featuring a patented step-within-a-step™ design. They're actually two steps in one with a step on top of the main housing and an additional step that automatically deploys when the door opens. 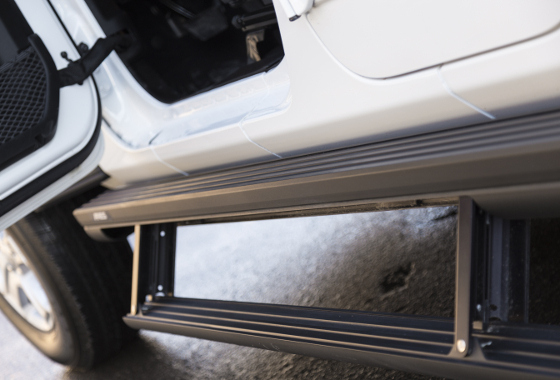 This two-step access provides safer, easier entry and exit, particularly on larger, lifted trucks, and especially Jeeps. ActionTrac™ also provides a unique offroad step solution. 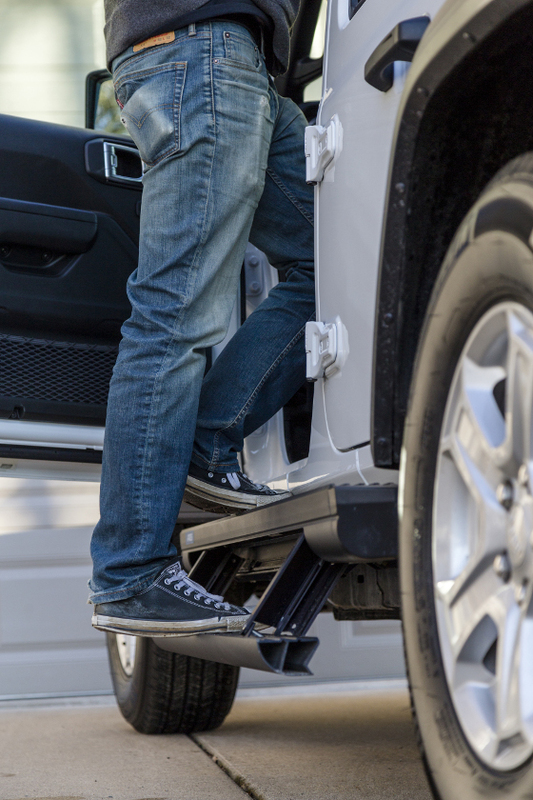 With the two-step access, the boards offer up to 15" of drop from the vehicle doorsill (varies by model). This is obviously very helpful on vehicles built and customized for offroading, such as the Jeep JL. The additional non-skid step on top of the main housing also gives the driver and passengers a convenient step up for accessing cargo or other items on the roof. Also unique to this design, all of the components -- including the single rotary motor, electronics, pivot points and the retractable step itself -- are shielded within the main housing of the boards. This protects them from water, dirt, grime and abrasions in any environment, making the power steps an exceptional fit for offroad applications. 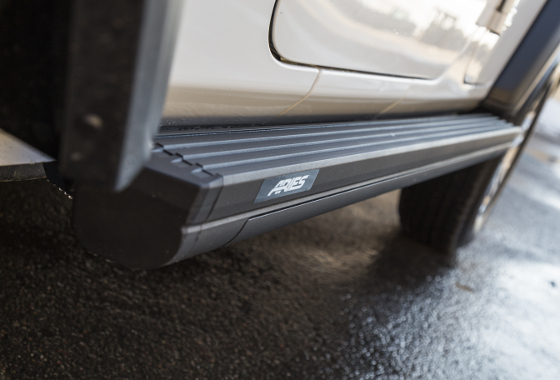 ARIES ActionTrac™ powered running boards feature a unique simple-2-install™ installation process. They require no splicing into factory wiring and no drilling for the brackets on the Jeep JL, as well as most other models. They use pre-existing factory holes, and the entire system is self-contained to easily connect directly to the vehicle's battery. Install time is right around an hour and a half versus three or four hours for competitive models (depending on the level of expertise). 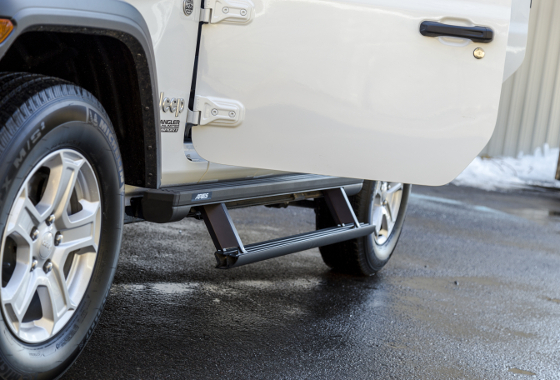 ActionTrac™ powered running boards also feature powder-coated aluminum construction, a 650-pound static weight rating and a limited lifetime warranty. They're made right here in the USA and are available for several other applications beyond the Jeep JL, including the Jeep JK and a variety of full-size pickup trucks coming soon. About ARIES: ARIES, a CURT Group brand, is a fast-paced marketer and innovator of truck, Jeep, SUV and CUV accessories. From automotive enthusiasts to professional builders, our products are built for the champions of individualism, innovation and attitude. We offer the perfect combination of unique style and durable construction, specializing in custom-fit grille guards, bull bars, side bars and running boards, as well as Jeep Wrangler accessories. ARIES products are made vehicle-specific for a custom fit, and they are available for a wide variety of makes and models sold in North America. About CURT Group: CURT Group is a leading sales, marketing, engineering and distribution company of towing products and truck accessories for all types of vehicles, from passenger cars to commercial trucks. Our family of brands includes CURT, ARIES, LUVERNE Truck Equipment, RETRAC and UWS. We are a team of more than 1,000 associates world-wide, with manufacturing plants in Wisconsin, South Dakota, Florida and the Philippines, and 12 regional warehouses across the United States and Canada. We stand for EXCELLENCE in our products and our associates. We aspire to be the industry LEADER by recognizing that the customer is KING and our associates are our greatest ASSET.